is the capital city of the Republic of Austria and a province in its own right. Located on the Donau / Danube river at 48.13N 16.22E, the city is the seat to several levels of government. The Federal Government resides in Parliament, the Municipal Government at the Rathaus Wien / City Hall. It is presided over by the Bürgermeister / Mayor of the city who also acts as Landeshauptmann / Premier of the province. . The Parliament and the Rathaus, among a number of other major landmark buildings like the Hofburg, Burgtheater, Opera etc. give the Ring Strasse a uniqueness, not found in too many other cities in the world. Wien, like Geneva and New York, is headquarters to a number of United Nations organizations. They are located in the 22nd district of the city, on the east side of the Donau, called the UNO City, a special site of modern, present-day Vienna. 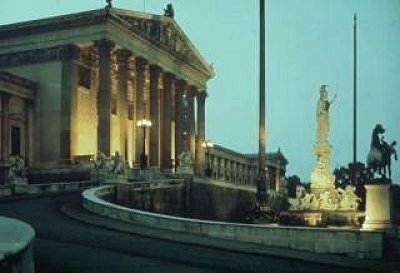 Wien was for many years the Reichshaupt- und Residenzstadt / Empire Capital and Residence City of a number of monarchs of the Habsburg Empire. The late Kaiser Franz Josef I (1830-1916) Emperor of Austria (1848-1916) and King of Hungary (1867-1916) lived here, as did other monarchs before him. Use the GenConnect query board for posting queries. The use of Surname Helper is also supported. The surname list is updated once per week. City Administration offers loads of on-line info. Wien on-line - the cities official internet service. Try the place finder page for other places. Try the land mark page for historic sites.